I try my hardest not to see things so black and white and to realize that each choice is unique from the next. It is something I have to constantly be present about because my natural instinct is to prejudge situations based on previous experiences. To add fuel to this fire, motherhood and parenting has become increasingly difficult over the past year – probably because we have 3 young children who are all in the age of discovering what they like to do. Which means, too many activities to manage PLUS two full-time working parents. I think this has led me to have a heightened sensitivity about my current season of life as well as increased amount of “Mom Guilt”. 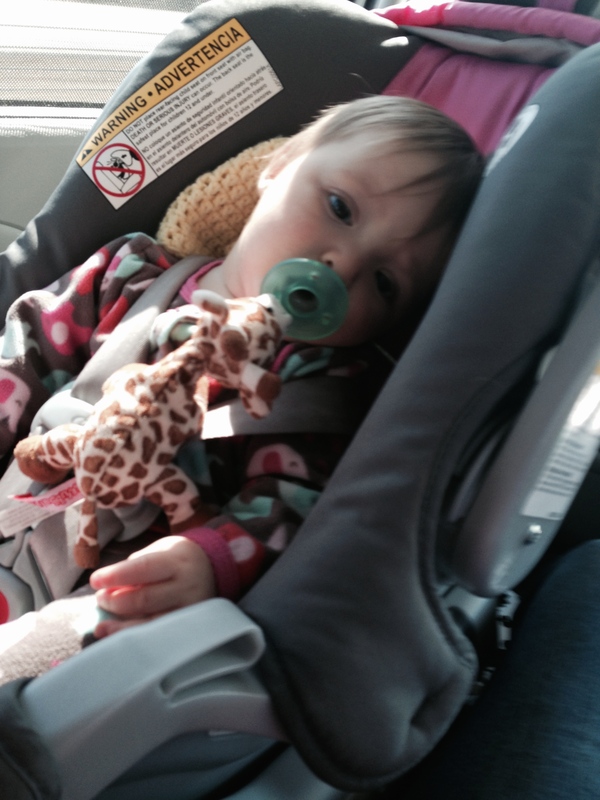 Geez – I could write a novel about “Mom Guilt”. About how it is unavoidable, unpreventable, and untreatable. But, I won’t. Because who likes to read negative ramblings anyway? Y’all. I was considering turning our lives upside down to move them to a school that could not keep them for a full work day and hiring a sitter to pick up my 3 children and drop my 3 children EVERY DAY just because I wanted to protect my children from hardship. THEN I would come to work and complain to my boss about the millennial I have working under me – She is too entitled. She has too high of expectations – someone failed her along the way because they never let her experience anything tough. So it didn’t hit me that I was a living hypocrite until I was driving to work this morning – sans kid drop offs because of a teacher in-service. I would have never thought I would be causing my children potential harm by trying to create the most perfect external environment possible. SIDENOTE – – I need to work on my control issues. I guess my purpose of this rambling is to provide some sort of “I’m going through this too” content instead of writing about the roses and glory moments that DO exist in my life. Parenting is tough. Choosing when to push and when to pull back is not black and white. And I don’t know everything. And my children will be fine – and WHEN they survive this transition it only means that they now have a solid life experience to help them with the next change that happens down the road. They have that experience because they overcame it on their own, while i sat on the sidelines prepared to hug them when it was at its toughest. What the heck is snapchat? And why does it matter? And why are businesses talking about this being the next big social sell network? Wasn’t it just yesterday that you were hoping your teenage daughter didn’t have this app downloaded on her smartphone? Simple Life: it makes my heart happy to hear so many people talking about getting a grasp on their lives and striving for more of a simple life. This leads me to start thinking about why businesses have not caught onto this yet. For so long, people believed that they were the only human being who was not capable of working 90-to-nothing during the work-week. Why have employers not caught onto this yet? Heat: It is so bloody hot in the South this time of year! Why do I pray for hot weather when it is cold and cold weather when it is hot? I probably belong on a tropical island somewhere where it is 75 degrees year-round. Or maybe I have control issues and I need to come to terms with these issues. Why does my 3 year old all of the sudden have a stutter? A friend of mine who works in the speech therapy industry tells me it is “developmental disfluency” and it is very common at her age. It drives me crazy though – I don’t know what to do when she does it. Do I try to correct it? Do I just allow it to happen and pray she self-corrects? It makes my heart hurt and my mind go wild wondering if there is something wrong. She did send me this article, which eased my mind slightly – knowing that it is typical for her age. Have you experienced this? I feel better now. Thank you for allowing me to have a place to dump these thoughts so I can get through the rest of my week. Happy Humpday! By the start of my second week I am starting to feel more aware of my surroundings and the effects this challenge is having on me and my daily choices. I find that I am putting more thought into each move I make rather than relying on my impulsive feelings and gut reactions. This is new to me. I am the reason that checkout lines in grocery stores are so profitable. I walk into a buying situation and I am immediately distracted by things that were not on my list but somehow they ended up coming home with me as a deemed “necessity”. My biggest failure during my second week is that I was not as reflective as I would have liked to have been with the challenge. When I started this journey, my expectation was that I would review my notes each day and reflect on the items of the challenge to measure what I was doing and what I was not doing. I find that when I am not organized and focused, my life really does spin out of control. I know this is common sense, but my lack of self-discipline masks this from my logic on a daily basis. Its like I go through the motions and don’t even realize that I am defying common sense! So, I’d like to spend week three focusing on developing my self-discipline. I believe this challenge is actually challenging people to do just that – develop some dang self-discipline! My method to attack this madness – slowly! – is baby steps. CHECK-IN 3x/day – how am I doing? Am I staying focused on my daily needs? EVALUATE how I am feeling at each check-in to gauge my efforts and adjust. MEDITATE. Start out small – with 5 minutes of quiet. While my lack of organization in the project makes it seem like somewhat of a flop – I am comfortable by the small victories I have had with checking my internal voices. We are very close to finishing our kitchen renovation and the timing could not be more perfect – my oldest babe starts Kindergarten next week, and with it a new chapter of chaos. So I want to know your tricks! If you have been living a more minimal lifestyle – how did you get over the transition hump? How did you stay focused and motivated? Thanks in advance for sharing! 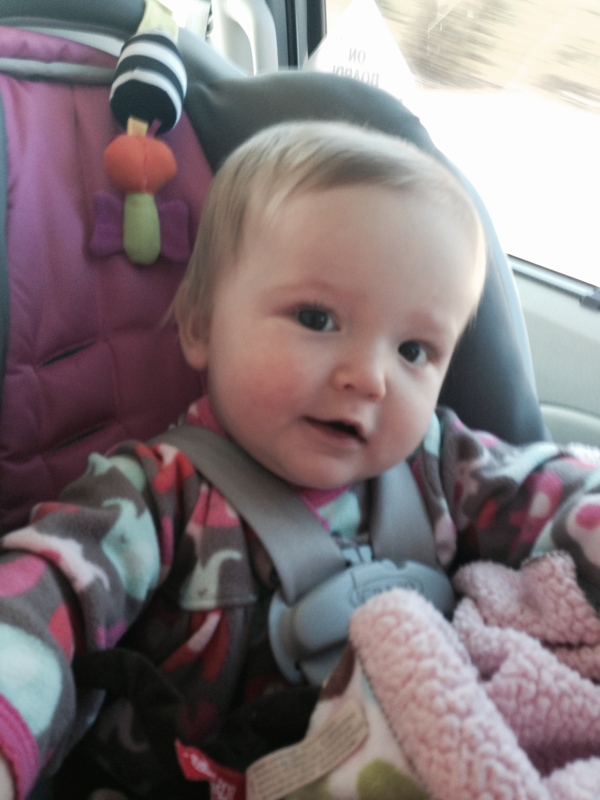 How to: road tripping with babies! When I was thinking about what I wanted to title this post, I thought to myself: Self, you should label it “Road trips with babies – DON’T DO IT!”. Ha – but that would be unreasonable. Because, as I found out and I’m sure others before me discovered as well, you sometimes just don’t have a choice. The beauty of being raised by parents who encourage you to take charge of your life and make the most of your oppotunities is that you end up experiencing some of the coolest places, people and things that you wouldn’t ordinarily if you lived life day-to-day. With all things, the are downsides to beautiful things in your life. My family is scattered across the United States. My brother moved to Indiana from D.C. a couple of years ago for grad school and I have yet to go visit him and his family. Thankfully – life forced me to head up there this past weekend. He was baptizing the newest addition to his family, baby Patrick. I’m pretty sure I would not earn any points with St. Peter if I didn’t even attempt at attending such an important event in a little Catholic’s life! So, last Friday, my husband and I hurried through a half-day at work and then took 2 hours (we had planned for 30 minutes) to load up the 8 Vera Bradley bags, two Graco pack-n’plays, 1 sparkly backpack loaded with God-only-knows toys, 2 iPads, 3 sets of ear phones, three car seats, bags of pump parts and bottles and cleaning supplies, boxes of snacks and sippy cups, red bull and other forms of caffeine, no gas medicine or teething medicine for the babies, and two stressed and fighting parents. We left behind the 3 huge boxes of clothes that I was pumped about dumping on my brother for his 2nd daughter to use as well as baby Patrick’s Baptismal gift. MOM fail #1: Plan breaks into your ETA. We had planned ahead at least, dividing the trip up into two parts instead of powering through in order to make it to South Bend by 1am that morning. So glad we had some sanity remaining to break the trip up. We made it to my sister-in-laws house by 9 that night – we were supposed to arrive around 7. When you are planning a trip with children, simply add 2 hours to the duration so to plan for 30 minute bathroom stops as well as a minimum of 45 minute break for meals. A break for meals is a must – babies, toddlers and preschoolers can not keep focus for 3 minutes, what made me think that they would not need to break out of their car seats after 5 hours of driving?? Mom fail #1. At the rest stops or gas station bathrooms – expect the changing table to be unusable (if there even is one). And once we passed through to the Eastern time zone it was much too cold to change in the van with the door open. We improvised and survived, but please equip your diaper changing set-up to completely cover the changing station in these facilities. Plus, bring along enough anti-bac to make it through a wild outbreak of the next bird-flu. 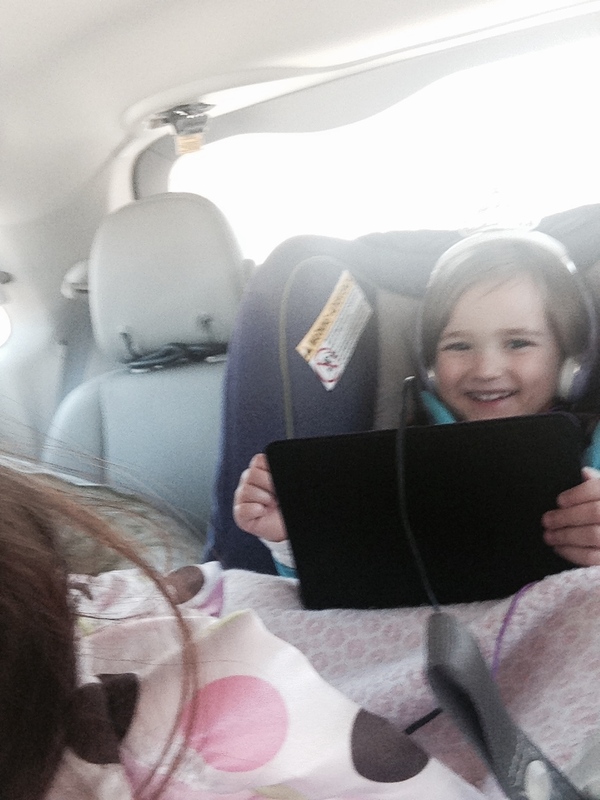 Mom fail #2 – ENTERTAINING YOUR CHILDREN FOR A LONG CAR TRIP. I remember back to around 2009 BC (BC = before children) when I promised myself that when I had children, we would never invite a DVD player into our car. We would only play games on road trips and color and do other educational activities. Right – well, I was young and dumb… about a lot of things. We have one device completely dedicated to videos and episodes to entertain our oldest for a max of 12 hours (enough time to get us to my hometown, Houston). Do not head out on a trip if this device is not fully charged and your adapter for the car is not readily accessible. Or, prepare yourself for an epic meltdown. If you have not experienced this already – be prepared to not be able to recognize your sweet, angelic three-year-old after they have been watching movies on an iPad for more than a solid two hours. WOW. They should do a psychological study on that. For sure. Mom fail #3 – Pack junk food. For this particular trip, I packed protein-packed, healthy snacks like almonds and hummus and pretzels. We lasted an hour. I’m pretty sure we were still in North Birmingham when we stopped for chips and chocolate. Healthy food is a crock when you set out on a family adventure, crammed in a car for an entire day with each other. Just pack the junk food – it won’t kill you to eat crap for a day. It will make you and your spouse happy. And that makes for a happy trip. Mom fail #4 – Check the weather. So, Spring has already started teasing us in the South. We had a week or more of 65+ degree weather. I had already packed up most of the turtlenecks and fuzzy sweaters. Why, when I knew I was headed to Indiana, where there is still snow accumulating? I blame “Mom Brain” (yes, that is a thing). So, I improvised. We bundled our kids up in double socks and the fluffy blankets I brought to make the pack-n-plays less like a rock for the twins to sleep on. I almost thought it couldn’t get worse than the 38 degrees we arrived in on Saturday morning. The 14 degrees the next day was much worse. Plus – I had no idea what the wind chill changed to when you were near Lake Michigan. Heads up… its cold. So cold. So, all in all. I hope you learn from my failures. If you are anything like me, preplanning is no joke while working full-time, taking care of three little ones and preparing your house to go under major renovation in the next couple of weeks. BUT, preplanning and a little organization will definitely take you so far and make your trip so much more enjoyable. We throughouly enjoyed seeing a family and spending time with everyone. I wish I had been less stressed. I wish I had not forgotten the gas medicine for the girls. I wish I had not eaten the refried beans at the Mexican restaurant on Saturday. But, no regrets! Just learn from the mistakes and move on. 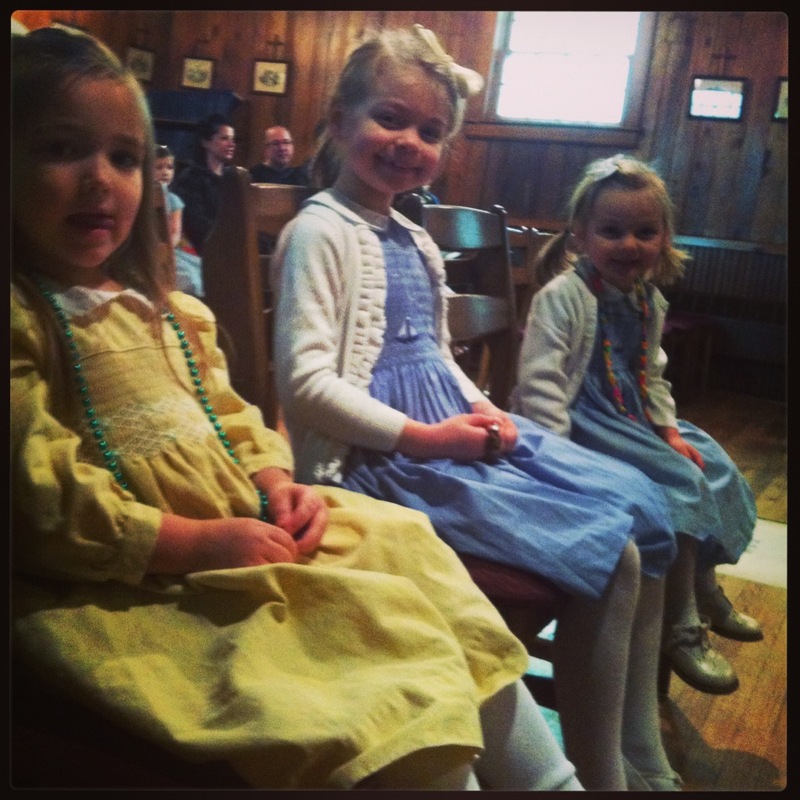 My Emma and my brothers girls at the baptism. We baptized sweet Patrick on Sunday and had an awesome time celebrating such a beautiful moment in his little life. I am beyond proud of my brother and it made the trip worth it to see him so happy with his growing family. I wish little Patrick a God-filled life and I trust 100% that my brother and his wife with see to it that it happens. Lots of love filling my heart this morning. 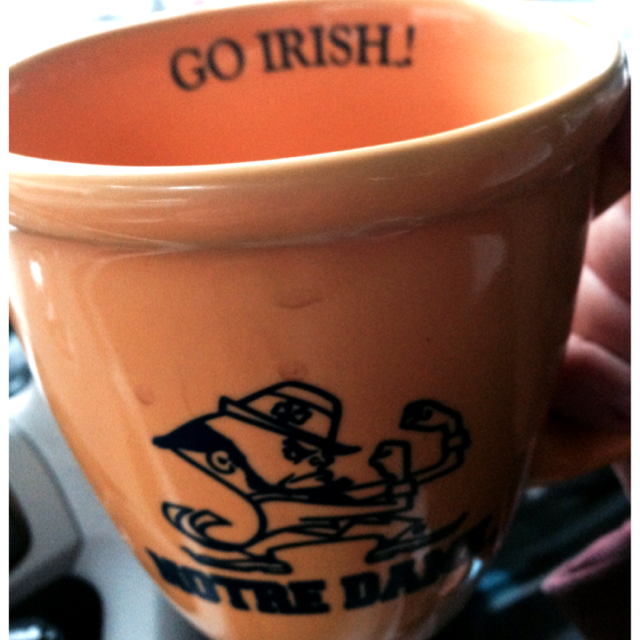 I don’t even mind sipping out of my South Bend souvenir this morning (in privacy, of course – ROLL TIDE). I’d love to hear your tips for traveling with wee-ones – please leave a comment below! I’m really hating the fact that for my first blog I am called to write contains negative content about being a mother. I try – most of the time – to stay optimistic about our current situation. Having twins when your oldest is only 3 is no joke. I understand that I am stating the obvious. People tell us all the time, “I don’t know how you do it!” Yup, BINGO! You win the prize! Because, we don’t know how we do it either. I also was naive enough to believe that because we chose to breastfeed, our kids somehow were enabled with superpowers. Our kids will never be sick – being glued to my breast pump is totally worth it. OK – breastfeeding IS totally worth it. If not for just the money savings. Sick babies are so pitiful! I digress. Back to my pity-party. I’ve decided – when we become millionaires – we are moving to Hawaii. I never want to see weather that dips below 65 degrees again. It invites sickness, depressing gray colors in the sky, and empty wallets (thank you America – for selling the holidays). We have managed to have one sick human being in our house for the past 4 months! How does that happen? Why don’t people wash their hands everywhere that go?!? Don’t they know that I don’t sleep through the night because of a constant state of sick-child? Geez. So, new moms, if you are discouraged by my post. Don’t be. It’s just the reality of the situation. What I failed to mention earlier, is that I am OBSESSED with the emotional pay I receive from being a wife and a mother. It’s like a drug. I am addicted to the high that comes from my babies locking eyes with me or hearing my oldest say “I lush you mommy”. 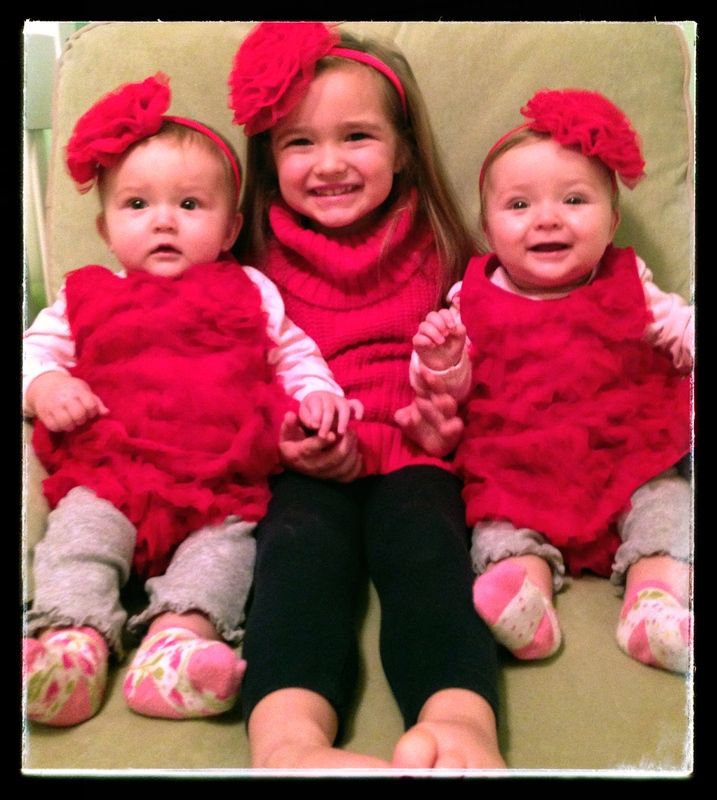 I would lay down on railroad tracks if someone said it would give my girls a better life. Which it wouldn’t – but the metaphor popped into my head so I went with it. AGAIN, breastfeeding is worth it. If you work, or plan on returning to work, pumping breast milk is worth it. That is all I will say about that. To the people with kids, without kids, oh heck – to all people: WASH YOUR HANDS! Or I will come and personally wake you up on an hourly basis at night.